We live in a world where the masses seem to celebrate those who have more and actually envy them for what they have. With that mindset, we tend to buy anything that we convince ourselves that we need—simply because we can afford it. Whether it’s a new phone every year, tons of new clothes or that second (or third) car that we need for the weekends, consumerism has taught us that we should buy new stuff as frequently as possible in order to remain trendy. We have made our lives cluttered with so many material things that we have ended up feeling hollow and overwhelmed by the things that we actually bought having convinced ourselves that we need them. But do you want to continue working for your stuff as opposed to living the fulfilling life that you constantly try to attain with your materialistic mindset? You probably bought all these things expecting them to make your life better, but is that really true? My question is simple: Are you honestly living a happy and exciting life with each of the items that you have? …how to simplify your mind. 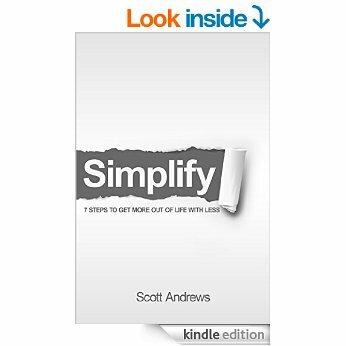 …how to simplify your everyday life. …how to simplify your living space. …how to simplify your work life. …how to simplify your finances. …and how to simplify your health and fitness. Start living a meaningful life today.